The old saying goes, “Money makes the world go ‘round.” We use it every day. We can’t acquire many necessary item needed in daily life without it. We almost always want more of it, but for coin collectors, money is much more than a piece of metal. It’s a hobby, a learning experience, and can be a lifelong obsession. There really are no hard statistics on the amount of people who collect coins in the world. Some people suggest that 1 out of every 10,000 people is an active coin collector. That’s pretty staggering when you think about the population of the world. People have been collecting coins for years. At one time, it was called the hobby of kings, but today people from all walks of life and of all ages are maintaining coin collections. Whatever the reason, coin collecting is a very popular hobby – one that can be pursued by all age groups. There are actually educational benefits to getting children started as coin collectors. The practice of numismatics – that is, the collection and study of coins, paper money, tokens and medals – offers the collector many different areas to specialize in. With the many specializations of coins, there is a wealth of material out there for coin collectors to concentrate on which makes it such an interesting and diverse hobby. 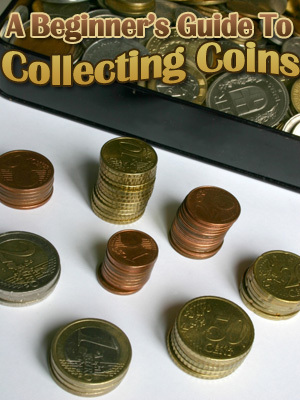 In this book, we’ll explore the phenomenon of coin collecting and give you ways to get started on your own collection. There are many, many nuances of the hobby and it’s almost impossible to give you all the information you’ll need to become a seasoned collector. What we have done is give you enough to get started in this rather enjoyable activity.